Executive Vice President and Director, Softbank Corp.
Public Talk: May 4 on "Asian Internet Companies and the Global IT Industry Dynamics"
During his residency, Eric Gan spoke on his experience with Japan’s telecommunications industry and weathering Japan’s most difficult investment climates in the past two decades, including at public talk with GPS Dean Peter Cowhey and as part of a conference, “Innovation and Entrepreneurship in Japan,” hosted by the School’s Japan Forum for Innovation and Technology. Gan also connected with students as well as executives at Qualcomm Corp.
Eric Gan is the founder of eAccess, a mobile telecommunications company taking on the myth held by both Japanese and foreign business that Japanese consumers were "different" from the rest of the world. His success in marketing low-cost mobile phones led to his career advancement—becoming the president of Ymobile, a SoftBank Corp. subsidiary, and later becoming executive vice president of SoftBank itself. He has led SoftBank’s pivot to overseas markets, especially in China and India, putting him at the forefront of Japanese companies expanding to new consumers. 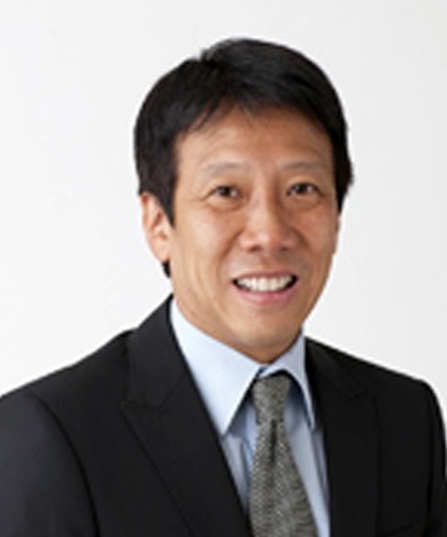 Prior to eAccess, Gan was a telecom analyst and managing director for Goldman Sachs Japan, where he was involved in advising telecommunications financing projects in Japan and Asia. Pacific Leadership Fellow Eric Gan's public talk on "Asian Internet Companies and the Global IT Industry Dynamics"